Heat oil in a saucepan and fry onion cubes for 2 minutes or until they become tender. Add minced meat and fry for another 5 minutes or until meat becomes brown in color and well cooked. Add MAGGI Secrets Bolognaise Mix and water. Bring to boil with constant stirring. Add potato cubes, zucchini slices and crushed black pepper. 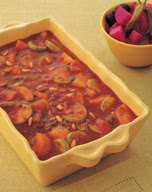 Bring to boil and simmer on low heat for 20-25 minutes or until vegetables are well cooked. Garnish with fried pine seeds and serve.